The model could be laid flat on table for teaching demonstration. It also could be hung in front of the chest. Conduct breast lumps palpation by sitting or dorsal position. Lumps of benign and malignant tumor are put into each side of mammary tissue to make palpation more convenient. It is available to identify comparatively and make a definite diagnosis through position, size, texture, and features like moving or fixed on the basis of palpation. 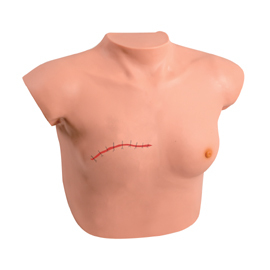 The model is very useful for differential diagnosis of benign lump and malignant tumor of breast. Moreover, it is available to perform postoperative care of mammectomy of one side.